Location: Infinity Park and Spa Hotel is located in the SPA capital of the Balkans - Velingrad, about 130 km from Sofia and 80 km from Plovdiv. Accommodation: The complex features 95 guestrooms. The rooms are fully furnished with TV, air conditioning, spacious balcony with table and chairs, mini bar, internet, telephones, SOS alarm, fire alarm system, access control and video surveillance. Bars and restaurants: There is a classic restaurant, lobby bar, and a bar. 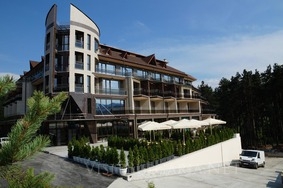 Indoor jacuzzi, steam bath, herbal steam bath, adventure shower, Kneipp trail, forest trail, Finnish sauna, herbal sauna, infrared sauna, indoor thermal swimming pools / semi Olympic swimming, aquatic, children, baby, ice shock and contrast , Salt bath, Turkish bath, relax zone, outdoor hot melt, fitness, jacuzzi and sauna. The complex offers a children's playground.